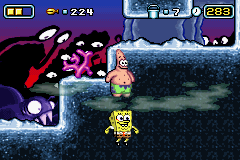 GBA The SpongeBob SquarePants Movie (USA) in 29:45.32 by jlun2. This is a game unusually suited for a run for a game based on a movie based on a (famous) TV series. While the game follows the movie's plot quite closely, the author manages to make it look almost incomprehensible thanks to sheer speed in glitching through the stages.